The ability for modern organizations to share information and documents is more important than ever. In today’s global environment, having file sharing that is limited to a single datacenter is no longer sufficient for many companies. IT administrators need to provide business-efficient ways to share those documents. File sync and share platforms allow companies to share files within their organization, beyond the boundaries of their own datacenter. Instead of accessing all files from a single location, with sync and share the files can be worked on locally and synced to a central repository. Those files can then be shared by multiple devices and multiple users from virtually anywhere. Amazon Web Services (AWS) is an ideal location for these types of workloads. File sync and share solutions from AWS Partner Network (APN) Partners use AWS services as building blocks to provide unique offerings to customers. In this post, we’ll look at CTERA, an APN Advanced Technology Partner with the AWS Storage Competency. Its headquarters are in New York and Israel, and CTERA provides access to files via servers, desktops, and mobile devices. There are two main components of the CTERA setup—CTERA Portal and CTERA storage devices. 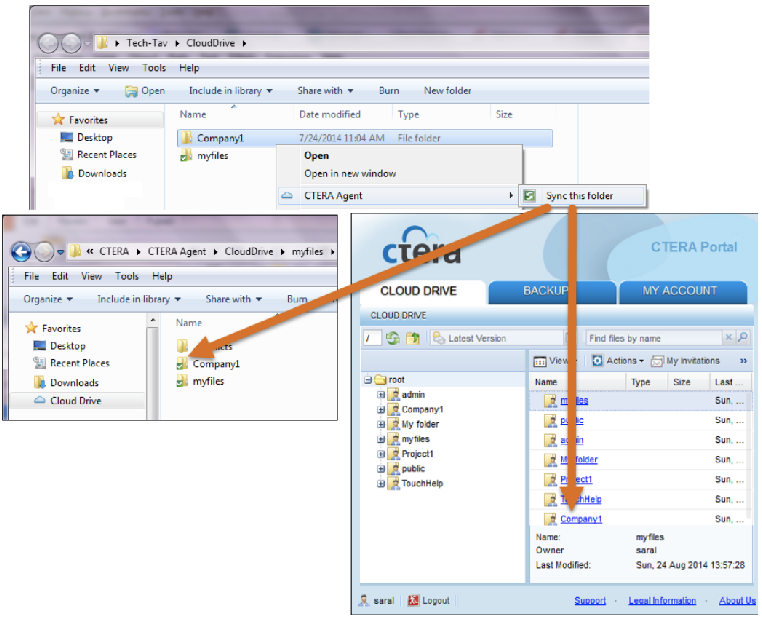 The storage devices are CTERA Cloud Storage Gateway, CTERA Agents, or CTERA Mobile. CTERA Cloud Storage Gateways can be deployed at a customer’s location and managed by a CTERA Portal deployed as an Amazon Elastic Compute Cloud (Amazon EC2) instance. CTERA Cloud Storage Gateway: The CTERA Cloud Storage Gateway can be run as an Amazon EC2 instance within the customer’s AWS account on an Amazon Virtual Private Cloud (Amazon VPC). CTERA Agents: CTERA Agents are available for both Windows, Linux, and macOS. They allow connectivity either through the CTERA Cloud Storage Gateway or directly to the CTERA Portal for storing files on Amazon Simple Storage Service (Amazon S3). CTERA Mobile: A client available for both iOS and Android devices. The CTERA Mobile app allows users to view and edit synced files. All files get stored on Amazon S3, as seen in Figure 1. The architecture includes a CTERA Portal server that runs on an Amazon EC2 instance. Amazon Elastic Block Store (Amazon EBS) volumes are mounted on the instance for hosting the metadata. An S3 bucket is created to host the data. From the client side in Figure 1 there are two ways the clients can interact with the CTERA Portal and data residing in the S3 bucket. The first is by deploying a CTERA Storage Gateway, which can be deployed as a virtual or physical appliance. With the CTERA Storage Gateway, customers can access data over standard NAS protocols like SMB and NFS. The second method is to load CTERA Agents on the clients, allowing them to directly sync with the data stored on the CTERA Portal using the CTERA Transfer Protocol (CCTP). Additional information on designing scalability and redundancy for a production architecture can be found in the CTERA Planning Documentation. 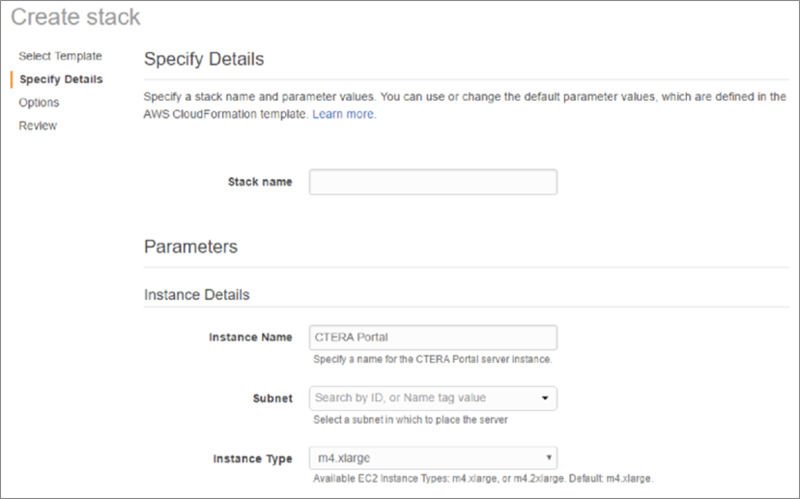 The CTERA components can be deployed on AWS using an AWS CloudFormation template provided by CTERA. See the CTERA website for more details on obtaining the template and getting access to the Amazon Machine Image (AMI). The template deploys the necessary AWS Identity and Access Management (IAM) Role, Security Group, Storage, and Amazon EC2 instance. For production environments, we recommended using replication and backups to protect the main server, which host a PostgreSQL database on Amazon EBS. The database holds the metadata for the files synced on the platform, and also needs to be protected to ensure recoverability and restoration of the data stored on the platform. The CloudFormation template provides the necessary parameters to deploy the CTERA Portal in your VPC. As can be seen in the screenshot below, you are able to specify the details when creating the CloudFormation stack. The parameters include options like what type of instance you want to run the CTERA Portal on, and what subnet in your VPC it should be placed in. Once the CloudFormation template has been deployed, the output will contain the http address for the admin control panel. You can start configuring the application by accessing this http address in the admin portal via your browser. You can also access the instance via SSH using the SSH keypair specified during the CloudFormation deployment. The first time you access the admin portal, you’ll be prompted with a configuration wizard. Proceed through the prompts specifying this as a master server since it’s the first server in the deployment. Provide user details, such as username and password, so you’ll be able to login to the portal for normal use. You will then be prompted for email server and DNS settings. Specify all the appropriate setting for your environment and complete the wizard. Once you complete the configuration wizard, you’ll be prompted for administrative login. 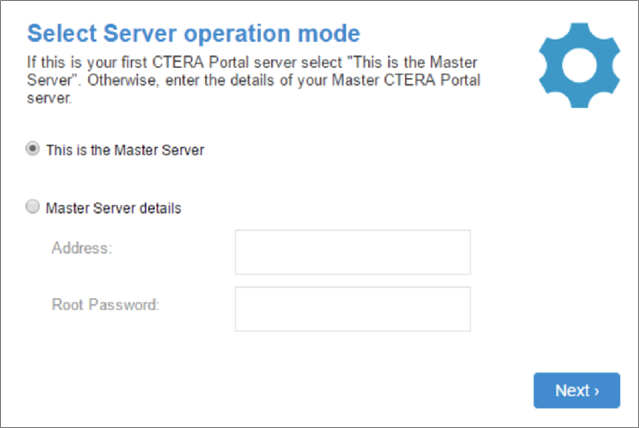 Specify the username and password established in the previous step to login, and go to the main dashboard of CTERA Portal. For a production setup, you can take additional steps to configure a DNS record, install an SSL certificate, and install a license key as part of the post setup steps. With the CTERA Portal now set up, install an agent on one of the supported operating systems. Once that’s done, client folders can be enabled to sync to the CTERA application server, which stores the data on Amazon S3 in a deduplicated and encrypted format. This provides the benefits of the high durability and virtually unlimited storage of S3 as a centralized repository for sharing files across many different clients. You can install additional clients as needed and begin sharing files. As shown in Figure 2, once the CTERA Agent is installed on a host a new folder can easily be set up for syncing just by right-clicking and selecting “Sync this Folder.” The left arrow in Figure 2 shows the green check mark for the folder indicating it’s set up to sync. The right arrow shows the same folder in the CTERA Portal. The Carlyle Group, a leading private equity firm, needed to overhaul their legacy Windows File Servers to enable “always-on” file access for its globally distributed offices. They sought a cloud-enabled solution to provide fast local file access for users and ensure their files would always be available from anywhere, even in the case of a network outage. The CTERA solution enabled instant business continuity for regional offices worldwide, and helped The Carlyle Group realize immediate ROI by reducing overhead and enhancing productivity, as well as eliminate silos of systems administration and globalizes data through CTERA’s centrally managed Storage–as-a-Service platform. Read more about how The Carlyle Group modernized their Office and user file experience with CTERA. File sync and share is an important workload for collaboration, and deploying a file sync and share platform on AWS is simple. With a few easy steps, you can deploy CTERA and start sharing files between many different clients and platforms. Visit the CTERA website for more information, schedule a demo, or start a free trial. 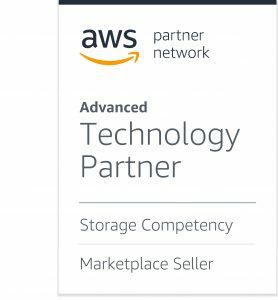 CTERA is an AWS Storage Competency Partner. They provide a private cloud IT-as-a-Service platform for storing, syncing, sharing, protecting, and governing data across endpoints, offices, and the AWS Cloud.